It is hard to believe Aero (Bobo) has been part of the MaPaw Family for three years! He now knows he is loved and safe with us and has actually become the class clown. He demands attention (which we are happy to give!) and wears a silly grin. He still eats separately, but he now realizes dinner will be ready for him every night. At the age of 13 he is slowing down a bit and being treated for arthritis. He loves to sleep in the MaPaw office on his blanket in front of the heater ~ happy to belong and able to “assist”. After so many years of abuse, Bobo is enjoying his senior years ~ and we are enjoying having him with us. Aero has now been part of the MaPaw family just shy of two wonderful years and helped us welcome in 2011. Our old guy has flourished with good food and lots of love. He did give us quite a scare in October when he suddenly stumbled, walked in circles and seemed unaware of his surroundings. Despite the stroke-like symptoms, we determined Aero had suffered Canine Vestibular Syndrome which resolved itself only leaving a permanent tilt to Aero’s head. We tell him it gives him a youthful look. 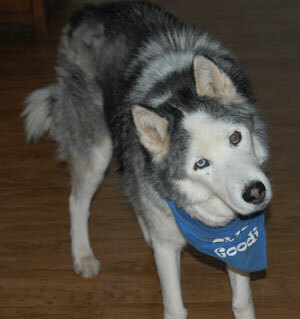 He proudly wears his bandana “Oldie but Goodie” and he remains happy and loved for what we hope will be a long time. Aero never knew what it was like to be a pet. He never had a chance. We were contacted by a busy city shelter to alert us to a cruelty case involving a Siberian who was dangerously thin, filthy and matted. Our hearts went out to Aero when we met him ~ his muscle mass had deteriorated, his confidence had faltered and yet he looked up at us with a glimmer of hope… and the tail wagged ever so softly. We knew we had to try and put the pieces together again for this broken and abused Siberian. Aero didn’t even know his name. We suspect no one ever called him by his name, probably never called him at all. He came into the rescue physically sick from starvation and neglect and at first refused to even eat or drink. We feared he had given up. This poor senior Siberian had been harmed in so many ways and yet he began to trust once again. He was given small frequent meals and his tummy began to adjust and the long road to recovery began ~ both physically and emotionally. Aero, also known affectionately as Bobo, has recovered physically though we fear his past abuse and neglect has taken it’s toll. He does, however, remain food aggressive (no doubt!) and will not be adopted for this reason. He is fed separately and has no other apparent issues other than some stiffness and perhaps a bit of senility. Aero is happy, finally. And we are happy to have him. He will be a loved member of MaPaw for what we hope is a very long time.